I love this book. It randomly came up at work this week when a coworker mentioned dousing herself in lavender and walking through the children’s department like a human air freshener. Yes, this is what we talk about. Anyway, I warned her not to end up like Grenouille, but it turned out that no one at work had heard of this awesome book OR the crazy good movie adaptation. So I had to fill them in–serial killings, orgies, cannibalism, stinky 18th century France. What’s not to love? 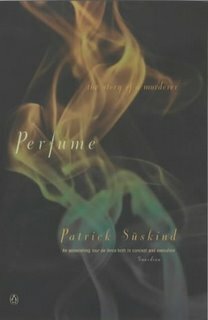 I don’t claim to have heard of or read every book out there, but for a while I felt like Perfume: The Story of a Murderer was everywhere I looked when the film came out. And I find out about so many good books through the film adaptations, so I thought this book was everywhere. Jean-Baptiste Grenouille is born without his own scent under a fishmonger’s table in the stinkiest part of Paris. Because he has no scent, people fear him. He has a gift, though. His sense of smell is the greatest in the world. He grows up and decides to become a perfumer so he can learn how to capture all the odors in the world. He smells a wonderful maiden one evening, and this leads to the above-mentioned serial killing, as Grenouille is actually quite an abominable individual. Eventually he creates the ultimate perfume, leading to the most bizarre, disgusting, oddly funny, and captivating series of events. I couldn’t put this down when I read it. It’s impeccably researched and absolutely twisted. A really unusual tale of human nature, scent, what makes us human…it’s a great read if you have the stomach for it.